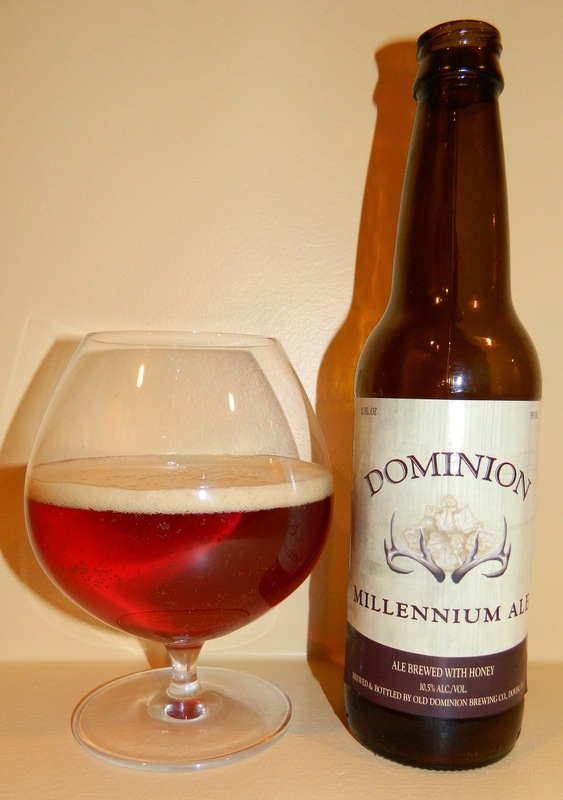 Dominion Millennium is a very strong ale brewed in the English Barley Wine style. 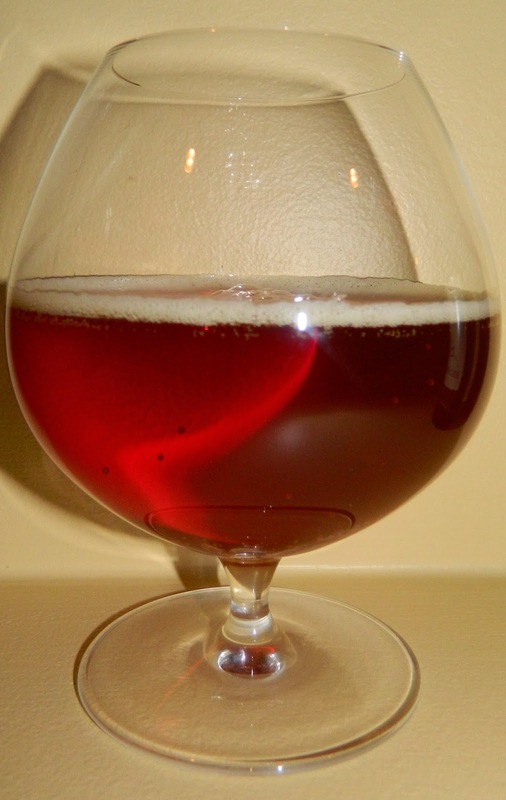 Often called the "sherry of the beer world", barley wine is best sipped at warmer temperatures, and should be enjoyed in moderation, as it contains twice the alcohol of regular beers. Looks like this is going to be another accidental aged beer review. This beer was probably given to me more than a year ago by my friend Gene. As I look at the label it was bottled in October 2013. So let’s see how this beer held up a year and a half later. The beer pours a clear copper with amber hues and a modest off white head. The nose is very interesting with sweet toasted and caramel malt aromas with an underlining sweetness that I assume is from the alcohol. What a very nice first sip; very smooth and warming. The taste starts out with a touch of malt sweetness up front on the tip of the tongue followed by a silky smooth mouthfeel as the beer rolls over the tongue in the middle of the sip. The back end is very easy drinking for such a big beer; there is very little hesitation on the top of the swallow. Following an almost effortless swallow there is a very rich and warming finish and aftertaste. The finish has rich caramel malt flavors along with a touch of hops that give just a slight bite. There is also a comforting warming sensation in the chest. The final aftertaste is of those lingering caramel and toasted malt flavors. What is noticeably missing is that classic harshness and intensity of the Barleywine style. I assume that is because of the age of this beer. Most of beers that I have aged have a reduction in the hop flavors and an increase in the malt flavors. I tried to get a fresh one but this beer is currently inactive and not available at my local store. I forgot to take a starting temperature reading but we are now at 53 degrees. The beer is getting smoother and easier to drink as it warms. Along with the warming of the alcohol it’s been a very pleasurable experience; especially since it’s cold with freezing rain and snow tonight. We have warmed to 66 degrees. This beer is amazingly smooth for a Barleywine. Another interesting thing to note is a lot of sediment in the bottom of the bottle. I know this is not a bottle conditioned beer so all of the sediment must be from the aging. I’m not sure what falls out of suspension when aging but all most all of the beers that I have aged for a year or more have a good amount of sediment. All and all this was a very pleasant experience. I’m always impressed when a beer ages well. I’m not sure what to rate this experience at. It’s B+ to an A- for sure but lacking that wow factor. My only hesitation is whether or not it’s fair to rate this as a Barleywine. It certainly has matured into a whole different kind of a beer. B+ | This was an impressively aged Barleywine with smooth rich caramel and toasted malt flavors followed by a very pleasant warming finish. Aged away were all the normally distinctive harshness and hop bite of the style leaving a smooth comfort warming ale.